Hello my friends from a internet free house. Coming you now from my phone, where the only thing of note that I have to say is that I’ve got work to do, and just perhaps the good Lord has taken away my wifi to ensure I do it. Once upon a time, on the night of April 16th 2012 to be exact, I read an essay online that broke my heart. Isn’t it funny how, at the time, you don’t realise it’s your heart that’s breaking? You don’t hear the sound of snap like with a bone. This night I didn’t hear anything at all. My husband was out at a meeting, and, because it was late, the kids were all asleep in bed. It was nine pm. I’m an early riser, and I tend to go to bed around then or just after, and read till I fall asleep. This night I didn’t though. This night I read the essay and shut the computer off quickly, but I couldn’t go to bed. I couldn’t say anything, and I was grateful that there was nobody there to not say anything to, because silence is awkward when you can’t, or don’t want to, explain it. It took half an hour for me to realise something had broken. I washed the dishes and tidied up the lounge room and wandered back into the study to turn the computer on again and reread it and then thought better of it and brought the cat in and checked the sleeping children and eventually, because there was nothing else left to do, went into my bedroom and shut the door. It must have been the click of the door jamb that did it, or maybe the so-familiar mess of discarded clothes and things to be dealt with. My unmade bed looked sad and empty, and suddenly I realised it was exactly like me. Words of an old song ran through my brain, and I looked away; turned my face into the coats hanging on the back of the door, and, just as suddenly as my heart had broken half an hour before, the sobs burst out of me. I cried for half an hour, no less. Every time my tears subsided that song rang in my brain again like a punch to the gut. I hadn’t heard that song in years, and I hated it right then with a passion that I couldn’t contain, and everything it represented. It was an old Laura Branigan song, and that one line “I don’t wanna know the price I’m gonna pay for dreaming/Now that your dreams have come true” pummeled me again and again. Dreams are hard to bear. The essay was beautiful. It was written by the very talented Vila Gingerich, and spoke eloquently of her childhood passion to travel the world, and how she’d buried that dream only to one day be able to live it. It spoke to me in the deepest places of my own childhood passion, to see North, and how my own plans for an overseas trip six months earlier had been thwarted by circumstances beyond my control. I still feel it in my body, that night of the heartbreak. I carry it with me, and maybe I always will, like a ridged scar where a wound has healed. I didn’t know then that, only seven months later, I’d be stepping off an aeroplane onto American soil for the very first time and getting my very first stamp in my virgin passport. You never know what’s going to happen in the future. This is the hard place. All you can do is bear the heartbreak of the present, and keep moving forward. I didn’t know, either, when I sobbed my heart out back in Australia after I returned home with a heart full-to-bursting with love for the good old US of A, that I’d be going back again so soon; that I’d be packing up my entire family and planning a mammoth two-month hike over most of the North American continent. You never know what the future will hold. That can be a hard thing. I’ve tried not to talk about the upcoming trip that much, mainly because I’m so painfully aware that, while this is my dream come true, so many of my friends and people I love dearly are still waiting for their dreams. It’s a hard place. There’s a price you pay for dreaming. I’m not writing this to say “Hey folks, it’s okay! It all works out in the end, and you’ll get your dream!” I can’t say that. I’m writing it to say exactly what that song said to me: dreaming hurts. Waiting hurts. Not knowing the future hurts. Watching other people walk out into your dream hurts too. This is why I’ll cry, yet again, when I’m on that aeroplane. This is why I’l never, ever, take my dreams for granted. I know it hurts. But keep believing. We were in church when he said it, which made it a hundred times worse. Well, not church exactly, but the fabulous little art/craft/secondhand shop connected to my mum’s church, and filled with steel-wool haired ladies bustling around trying to sell us padded coat hangers and antique electric jugs. And, to make matters worse, he’s got the most piercing, piping little voice you’ve ever heard. The kid has a natural stage voice, and can cut through a crowd in a second to make himself heard without even trying. He’s only four, in his defense, and his big brother had recently lost yet another tooth, so the tooth fairy had made an appearance, she of the shady past and hazy details; she of the “what do YOU believe?” status, showing our kind of reluctance to tell either the truth or the lie to a kid so young. And that may be it, it may be the reason why he said it, because he’s a logical kind of kid and he needs to know black from white, true from TV, and it’s his way of questioning, these bald statements of un-faith in a tone that suggests he’s really fifty and explaining things to his four year old self. I find it hard with that one. If I tell him Jesus lives in my heart he thinks Jesus is small. And Jesus died on the cross some 2,000 years ago, so what’s he doing in my heart anyway? And if he’s in MY heart, how can he be in anyone else’s? So we explain the Trinity as God in Heaven who has a body but whom we can’t see, Jesus is Heaven who has a body and came to earth, also whom we can’t see, and the Holy Spirit, who doesn’t have a body, who’s the presence of God with us here. He doesn’t really get it. Who would? Theologians with years more experience than me still can’t fully explain the Trinity, or how all three can be one. Why would my four year old understand it either? But it bothers me sometimes, the times I worry about whether I’m failing my child or my church for not giving him the most complete religious education I can. I try my precious best. I love him for all I’m worth and I pray every night that the reality of the presence of God that I’ve experienced so deeply and so transformatively will one day seep into his consciousness. I think, deep down, he knows that presence. Unfortunately, or fortunately, he probably knows nothing else but that feeling of peace and love. Fortunately. What am I saying? This is a GOOD thing. I’m trying to quell the guilt. It’s not helpful. And if I believe (as I do) in a God who is big enough to create the universe and create man in his image, then I must believe that God is also big enough to correct my mistakes when I ask him to. I don’t worry that much. Not anywhere nearly as much as I pray. And play. And bake. Happy Monday everybody. I’m hunkering down with edits for my novel, which need to be finished in the next six weeks before I jet-set back over to the good old US of A to go to the ACFW conference in Indianapolis and try and convince people it’s so awesome they should publish it. Or something like that. So I’m not blogging at the moment. I’ll stop in and give you something interesting to read instead, but it’s unlikely to be from me. Today’s article is both profound and heartbreaking and incredibly, beautifully, poignantly written. It’s a personal essay written by Deborah Vlock, who I’ve been incredibly privileged to get to know through her blog, and who comments from time to time on mine. This essay is about her experiences with her son, now (I believe) fourteen. Please read Benjy, Awake. Let it break your heart for a minute. Then, if you think of it, say a prayer today for Deb and for Benjy. I’m meant to be writing. It’s ten to six in the morning already, and so far I’ve checked Facebook, read my emails, checked Facebook again and deleted my emails (I was up to 700 the other day. I’m such a hoarder). Put a few emails in folders. Sent a message. Checked Facebook, you know, in case I missed anything fascinating while I was patting the cat or making myself that cup of tea. Patted the cat. Made myself a cup of tea. Remembered I was meant to be writing. As a matter of fact, I’m meant to be REwriting, which is my personal version of writing hell. I hate rewriting, unless I hated the first version of what I wrote, which usually I don’t, otherwise I wouldn’t have written it. Unfortunately though, what I’ve written already is less than perfect, and so rewriting it is. I can do it. I will, in fact, do it. Just because I’ve been putting it off for the last couple of months (I’ve had good reasons, okay?!) doesn’t mean I won’t do it. I will. See? That’s the trouble with natural pauses in writing. They make you check Facebook. Oh look, Dani Hickey is in Romania, which is somewhere I’ve always wanted to go. It makes me wonder if she’s ran into my friend Wanderer, whose beautiful blog about life in Romania I tried to tag but could no longer find, and I’m must have deleted the last email blog update by accident because I can’t find that either, and see? This is the problem. Now it’s 6am. I’ll have to write to Wanderer today. Or maybe next week because Today is still looking rather busy, and there’s all that Facebook checking still to be done, and the rewrites. And the dishes, because I didn’t do them last night like I should have. I should have blogged last night too. I tried to. I realised though that by 8pm I had absolutely nothing to say – sensical or not – to anybody. I’d run clean out of words. Do you ever find that? I read an article once that men and women have an allotted number of words for each day (women more than men) and once they’re gone they’re gone. Men usually use theirs all at work, and by the time they get home they’re exhausted and spent. Stay at home mothers (like me) on the other hand, are desperate for conversation, desperate to get out all those words pent up inside them to make ready for those for the next day. I think it’s true, to some extent. Certainly true for me. That’s why I enjoy Facebook. 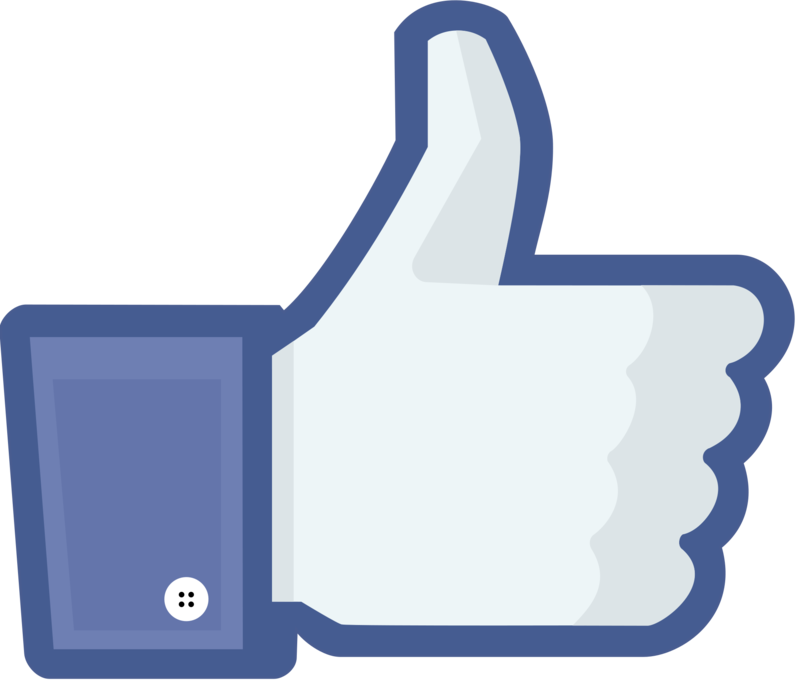 Although I don’t like those selling posts, especially where I’m suggested pages for my newsfeed about glittery sneakers, or plastic surgeons, because one of my friends “liked” their page once. Sure, I love glittery sneakers, but I like Romania better. I did a search for Wanderer by her real name (because I know it) and discovered a rather funny site, Radaris or some such, where you can see people’s contact information, places they’ve lived, who they’re related to, their age and such stuff. And places you’ve lived in the past. And not only that, it links in to social networks, with photos and stuff. AND it asks your opinion of them! Sheesh. So I started typing in friends with obscure names, and found that in a country of 350 million people some of those names aren’t that obscure after all. 6.30am. Kids are up now, asking me for things. And I’m hungry. Need to cook that porridge soon. It’s been quite a week. I never thought I’d be saying this, but I’m really glad it’s Monday today. A chance for new, for settled, for picking up where we left off before the new kitchen and the missing cat, and a slice of normalcy (or as normal as normalcy can go on the first day of mid-winter school holidays). 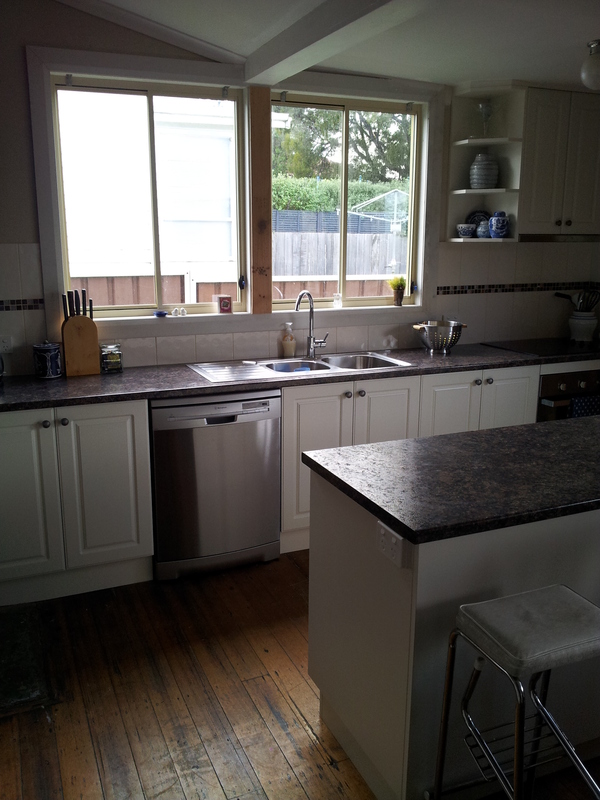 So the cat is back, the kitchen is pretty much done (still some painting and some new blinds to go, but that’s neither here nor there, and both are staying firmly over THERE for a little while thank you very much!). 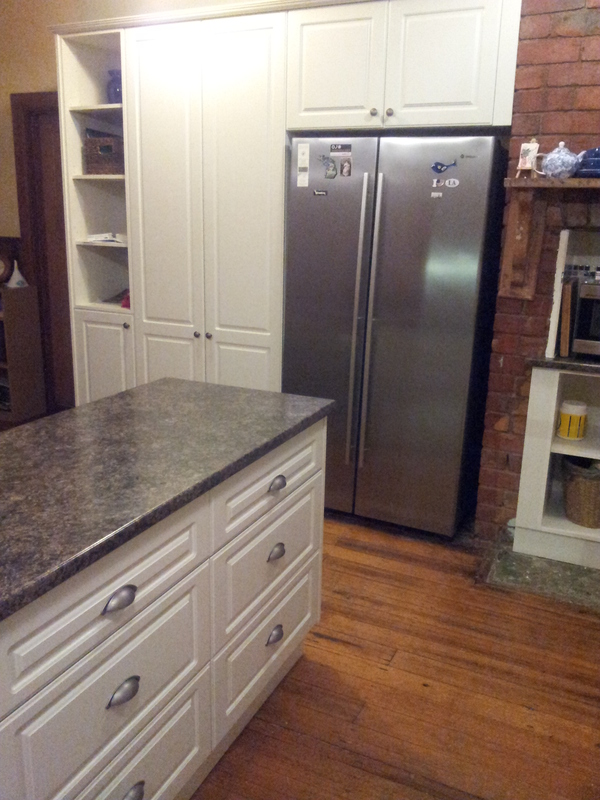 Yesterday afternoon, thanks to my fabulous in-laws, we finally got the old fridge, freezer and ever-so-slightly-falling-apart old flatpack pantry out of the house, and therefore we’re now rediscovering the lounge room under all the excess kitchen stuff. It’s nice. Hey, there’s carpet back there. When did that happen? Want to see some pictures? You bet I want to show them to you! OMG there are shelves, drawers, and cupboards for EVERYTHING! I love this fireplace. 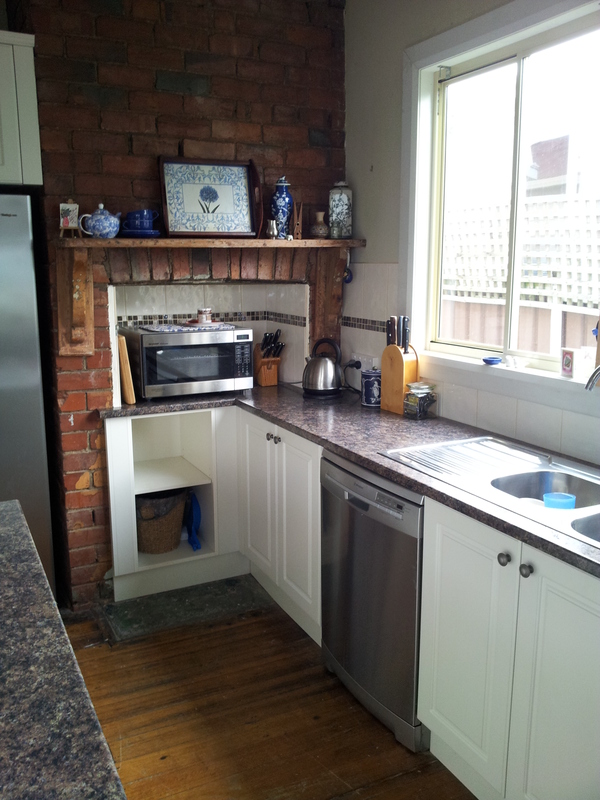 It used to have the old oven in it, and a bunch of useless space around it. It has a dishwasher!! And actually IN the kitchen!! Seriously folks, if yours is in the laundry (like mine has been for years) you should put it in the kitchen. Man those things can change a woman’s life! All that money, all that time. All that stress. All that but-I-loved-it-while-they-were-building-it. I didn’t like it. Well, not so much that I didn’t like it. They’d grouted the tiles in an off-white grout, presumably designed to blend in with the off-white tiles and the off-white cupboards. I hated that grout. I hated the way it blended with the colour of the tiles, especially the feature tiles, and made it look just like something out of a Home and Garden spread…from 1983. Nothing wrong with 1983. It was a good year, really…thirty years ago. And I didn’t spend all that money and all that time and stress and craziness for 1983. You can see it in the photos if you look hard. 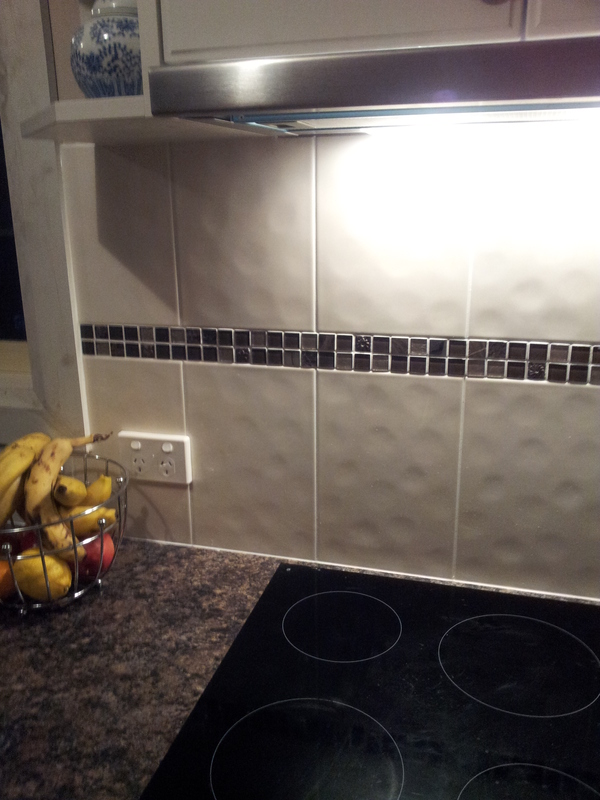 The grout is kind of orangy, a bit darker than the tiles themselves. It’s not a big thing, not really, but I couldn’t look away. After a few days that ivory grout became the biggest thing in my kitchen, like it had grown into a massive, stressful, kitchen-eating monster. I know, I know. First World Problem. And here’s me having dreamed of a new kitchen for so long, and there are so many GOOD things, like a dishwasher in the kitchen, a tap that works properly, oodles of storage, you know? But I hated the grout. By Friday morning I’d made up my mind. I, who’ve been taught well not to make a fuss and to be grateful for what I have rather than complain about what I don’t have, I called the kitchen people and told them…TOLD them, mind you…to fix it. Felt like a naughty kid testing the boundaries and stomping off to my room in a tantrum. Told them. They fixed it that day. White grout makes my heart happy. I walked into the kitchen on Friday afternoon and saw that new grout, and the mess the disgruntled tilers had left, and just like that a weight lifted off me. It was good. 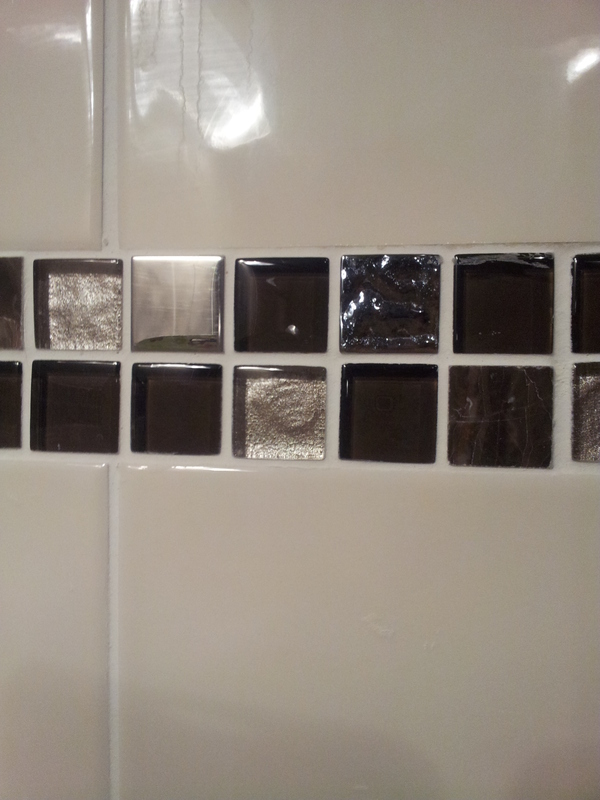 I know, the stress of the wrong-coloured grout was wildly exacerbated by the craziness of home-upheaval and the worry about the missing (and recently discovered) cat. It certainly hadn’t been an easy week. But in that small moment I realised a good lesson: just as it wasn’t the tiles that were wrong – I’d chosen them carefully – it was the grout, sometimes in life it’s not the big things (like a marriage or a job, for instance) that are wrong, but the little tiny stuff around them, the stuff that’s easily changed. It takes wisdom to see it. Making that phone call and getting them to change the grout was worth it.